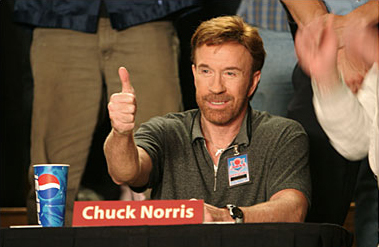 This blog post has been certified and approved by Chuck Norris' beard! I'm all about positivity and promoting health. Get Off My Internets (GOMI)!? I won't give them the satisfaction of linking to their site. If you want to know what they are, you can look it up yourself or check out my First Installment of their antithesis! OK fine, I'll summarize: they are a bunch of uber-critical n00bzillas that like to tear down online personalities such as bloggers, vloggers, or healthy living writers. Not here though, all good stuff here! Since I couldn't fit even a small percentage of some of my favorite online influences in my first post, here is ROUND 2: FIGHT (Mortal Kombat reference, anyone?)! of my new series "Get ON My Internets" praising positive influential social media personalities. Check these people out, you'll be glad you did! Layne Norton, aka BioLayne, has a PHD in biochemistry, is a professional Natural bodybuilder, an accomplished entrepreneur, and is one of the most influential figures in fitness nutrition and supplementation in the world. He's a published author, fitness spokesperson, and might just be the savior of steroid-free bodybuilding. Now here's a guy that helps to break the stereotype of all bodybuilders being steroid-injecting meatheads with low IQ! Brad Scott is a fitness model, YouTube Partner/vlogger, and nutrition guru. He's got a ton of great free videos and fitness tips so use his stuff as a resource! He's also very polite and helpful any time you message him or comment on his media, always good to see someone be accessible when it comes to helping others. I've worked with Helen for a few years now and she is an excellent local Boston wellness practitioner and entrepreneur. She's a certified and Reiki Master, Reflexologist, and Energy Medicine Practitioner as well as health and nutrition expert. She has been helping to improve the health and reduce the stress of the Greater Boston population for many years now and is now doing more to help worldwide with her new website, blog posts, and videos. She's always very kind and respectful and has the respect of many. Charlotte, or Char__latte as you'll find her on Twitter, is a FitFluential and Oakley Ambassador that gives you the food, fitness, and fashion that you crave on a daily basis! Want to learn? Want to laugh? Want to live free? This is your fit pro gal, and you'll find her enthusiastic and entertaining posts a breath of fresh air. Fun and fit fo sho! Big Lui! (not to be confused with "Big Louie!" -Arnold Schwarzenegger to Lou Ferrigno in Pumping Iron the movie). Another natural bodybuilding master? Damn straight! Lui is an incredible YouTube Partner and Fitness vlogger that has nearly 1,000 videos and an enormous (and still rapidly growing) fan base on his 3 (or more?) channels. His videos cover every aspect of fitness, natural bodybuilding, nutrition, products, and much more. He's also one of the nicest and most honest of online fitness gurus you will find out there. Stay Positive & Stay Healthy My Friends!